The Clone 4D is a unique multi-axis router duplicator. It’s as close as you can get to a 4 axis CNC machine without the price tag! The Clone 3D is high quality professional grade router duplicator, designed for the discerning craftsman who requires the best tools for the job. 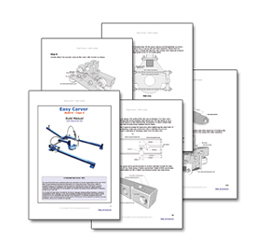 The Easy Carver build manual/plans consists of over 130 pages of easy to follow, step-by-step, illustrated instructions, showing the reader how to fabricate a router duplicator (using off-the-shelf parts) capable of carving 200mm, to 600mm wide. What is a Router Duplicator? A router duplicator (also known as a router copier, copy carver or wood carving duplicator) is a machine that uses a woodworking router to carve 3D wooden items. The principle is very simple. A router is attached to one side of the machine and a follower or stylus is mounted to the opposite side. The router and stylus are fixed to the same axis so they will always move in unison. The item that the user wants to copy is known as the master. (This master could be almost anything, i.e. a gun stock, guitar body, a table leg or a propeller.) This master is fixed to the stylus side of the duplicator and a wooden blank is fixed to the router side of the machine. The user then follows the contours of the master by manually guiding the stylus tip over the master. The router follows the movement of the stylus and copies/carves the shape of the master out of the wooden blank using the router’s cutter. To make this process easier, the weight of the router is counterbalanced, and the stylus tip (which is either the same dimensions as, or slightly larger than, the cutter) is made of low-friction nylon. Different size cutters and stylus tips can be used during the carving process, larger cutters for roughing out and smaller cutters for channelling and final finishing. Most router duplicators are designed around the same principle. 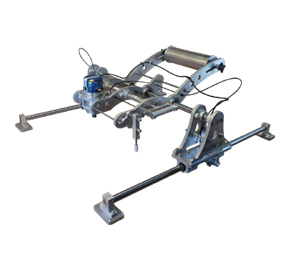 A U-shaped jig/carriage which is attached via linear bearings to a bearing rail, allowing the carriage to pivot (much like a seesaw or teeter-totter). This rocking action is equivalent to the plunge action of a router. The carriage can also be pulled and pushed along the length of the bearing rail, this action is for cutting along the width of the workpiece. The main router assembly, linear bearing and bearing rail are mounted to two additional horizontal rails, attached via linear bearings or rollers. This allows the main router assembly to travel down the length of the workpiece carving as it goes. This basic yet effective design allows for 3 dimensions of movement. When a woodworking router is attached to the duplicator the router is freed from its usual constraints of being hand held or fixed to a router table. This turns the router into a versatile wood copy carving machine capable of carving many 3D wooden items, such as guitar bodies, propellers, gun stocks and furniture components, to mention a few. What makes a good router duplicator? To build an accurate and safe router duplicator it is important to use suitable materials such as steel, aluminium, or a mix of both. This will reduce flexing and increase stability as well as help resist the forces from the router when carving. This is especially true when using a powerful 1/2″ router. As linear bearings are an integral part of a well-built quality router duplicator, it is important that the bearing be bolted to a flat surface in order to run smoothly. This is why the Clone 3D and 4D duplicators are constructed using tooling plate which is machined both sides to high tolerances, ensuring a perfectly flat surface and subsequently smooth operation. Adjustable and proper counterbalancing of the router and router assembly is crucial to a positive user experience. A poorly balanced duplicator will feel unstable and twitchy to use, causing user fatigue. 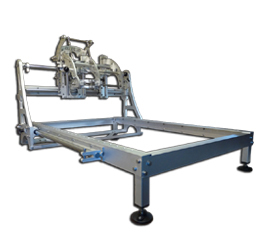 Due to the simple design, a single pivot duplicator has few moving parts making it robust, reliable and straightforward to use. However, one downside to the single pivot design is that when the router moves downwards the cutter does not move down vertically, it follows an arc. This is not normally a problem when carving the outside surface of an object, especially when using a round nose cutter. However, when using a flat bottom cutter (when cutting channels, slots and inlays) it can be difficult to carve right up to where the bottom of the slot meets the sides. This material will then need to be removed using a chisel. 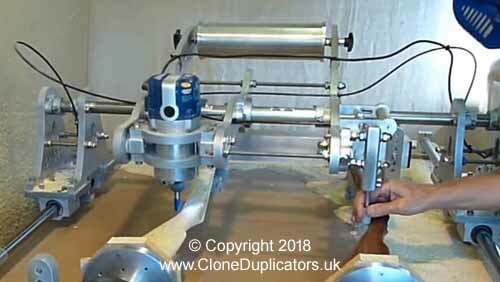 The Clone 3D Pro duplicator is a professional grade router duplicator which incorporates features not usually found in a single pivot design, such as an adjustable router head and stylus clamp. This allows the cutter to finish vertically when it reaches the bottom of the cutting depth. The Clone 3D Pro duplicator’s extremely robust heavy-duty construction, helps resist the forces of the router and makes the duplicator more stable to use. 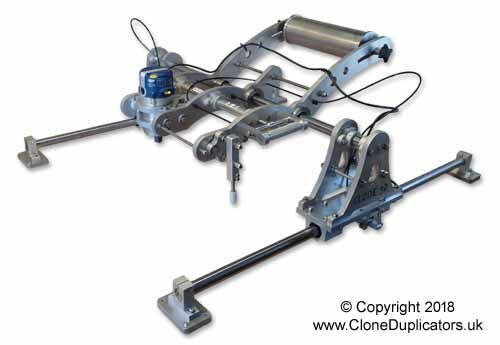 The Clone 3D Pro duplicator is also fitted with a dual anti-kickback braking system which, when applied, stops the main router carriage from moving backwards along the horizontal rails. This is particularly useful for roughing out when more material is being removed. The Clone 3D duplicator is available in three sizes. The Clone 4D duplicator is our flagship duplicator and is the most popular machine to date. Not one rest on our laurels, the question was asked – how could the single pivot design duplicator be bought up to date and improved upon? Two main design improvements came to mind. 1. A router duplicator that had true-vertical-plunge-action so the router didn’t follow an arc when cutting vertically. This would mimic the router’s normal plunge action so the duplicator could cut more accurate channels, slots, etc. It would also allow the machine to be used for other woodworking, routing and drilling operations, too. 2. Using springs instead of weights to counterbalance the router. Doing so would mean that the counterbalance force would be much more consistent throughout the range of movement. This would create a much more stable, and safer, duplicator. A list was made of all the features the ultimate router duplicator would have, and then the design process began. Two years later the Clone 4D was launched. Everything about the 4D has been designed from scratch. We believe that the unique design features of the Clone 4D make it the most versatile router duplicator on the market today. The experience of using the Clone 4D as opposed to a single pivot router duplicator is totally different and can’t be compared. The 4D is super stable, virtually vibration free and very comfortable to use. You can see Clone 4D in action by watching the numerous Clone 4D demo videos. Creating a high-end duplicator like the Clone 4D is not cheap and takes a lot of man-hours to produce. Each duplicator is hand-built to order from the ground up in a small rural workshop on the edge of the Cotswolds in the UK. Being a small company working in a very niche business means that production levels are small and only a handful of fully built machines are produced each year. However, demand for the Clone 4Dwill often outway production, so to make the Clone 4D more accessible, a Clone 4D kit has been produced. 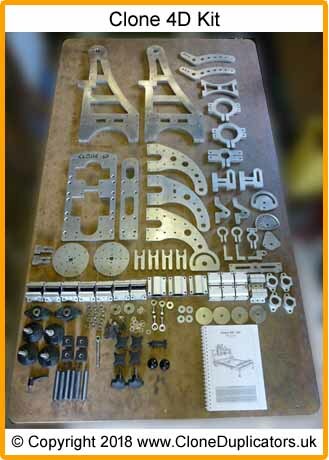 With the appropriate fabrication skills and equipment, the purchaser of a Clone 4D kit will have the satisfaction of building their own Clone 4D and thus becoming parts of an exclusive group of 4D owners around the world. A saving of up to £1800, compared to the cost of a fully built machine, and a significant saving on the shipping cost, will also be made by the kit builder. More information on the Clone 4D kit can be found on the kit page of the website. Clone duplicators first started designing and manufacturing router duplicators back in 2008. The very first duplicator that was offered for sale was the Easy Carver. This duplicator was designed to be one of the cheapest router duplicators on the market whilst remaining robust accurate and versatile by utilising almost any standard plunge router. The Easy Carver proved very popular and was in continuous production for over 2 years until being superseded by the Clone 3D and Clone 4D. The Easy Carver design was shelved for a while whilst the attention was placed on developing and manufacturing the 3D and 4D. From time to time requests for the Easy Carver still came in, but production had stopped. Realising that there wasn’t a decent set of router duplicator plans available, (most DIY router duplicators were crude designs made of wood and not really suitable for anyone wanting a serious, well built, and accurate machine) the decision was made to publish the blueprints of the Easy Carver. Using readily available off-the-shelf parts, the Easy Carver CD200 can be built for as little as 300 UK pounds sterling. Five model sizes can be built using the easy to follow, step-by-step instructions. Router duplicators capable of copy carving 200mm wide (CD200) to 600mm wide (CD600) can be built, and all models can be fitted with an anti-kickback braking system. 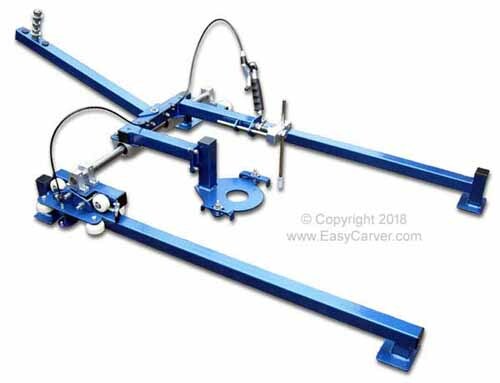 If you can cut, drill and weld mild steel then you should have no problem building the Easy Carver. It’s probably the best DIY router duplicator available. Woodworking routers (plunge routers, palm routers, fixed base routers) are an essential part of any serious woodworkers workshop. They have many uses but are restricted to being hand held or fixed to a router table. Attaching a router to a router duplicator adds another dimension to the router’s functionality, enabling the router to move more freely in 3 dimensions. This gives the router the ability to carve many 3D wooden items such as guitar bodies, furniture components, gun stocks, propellers, etc. The Clone 3D and 4D have been designed to carve larger items (up to 450mm wide x 1000mm long x 150mm deep) which are usually made from hardwoods. A powerful 1/2″ router like the Bosch 1617EVS 2-1/4 HP router (US & Canada Only) or the mighty Xact 4.2″ 2400 Watt router motor is required for this purpose. Pairing a 1/2″ router with a good quality 1/2″ cutter will significantly speed up the copy carving process and ensure the best possible finish. It’s also safer using a 1/2″ cutter due to the increased diameter of the cutter’s shaft which can cope with the loads and stresses much better than a 1/4″ cutter can. Can the Clone 3D and 4D be used as a Gun Stock Duplicator? We get asked this question all the time and the simple answer is yes. The Clone 3D and 4D will duplicate many 3D wooden objects including gun stocks, in fact, a majority of our customers are stock makers. To duplicate a gun stock, the stock and blank are attached to the rotating clamping system which comes as standard with the Clone 4D and is an optional extra for the Clone 3D. The rotating clamps allow the master and blank to rotate in unison (360-degrees) when copy carving. 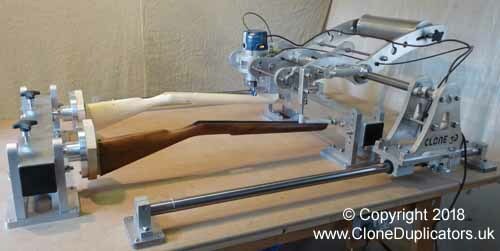 You can see the use of the rotating clamps by watching the Clone 3D duplicating a gun stock and the Clone 4D duplicating a Queen Anne style table leg, which is a very similar process to carving a gun stock. A manually operated router duplicator shouldn’t really be compared to a computer-driven router. Although at first glance they seem to do the same job, look closer and you’ll realise that they are very different machines. Generally speaking, a CNC router has been designed to produce the exact same object, over and over again at the push of a button. This is perfect for mass production and is unrivalled if producing exact carbon copies is required. With a CNC router very little, if any, woodworking skills are needed to produce the finished article; it’s more important that the operator be skilled in CAD and computer programming than it is to be a skilled woodworker. This process removes the skill of the craftsman from the creation process. Unfortunately, this seems to be an all too familiar scenario of our modern world and is why valuable skills are getting lost. On the other hand, a manually operated router duplicator is reassuringly simple in comparison and still requires a level of hands-on woodworking skill and knowledge to operate. There is no interface to remove the woodworker from the creation process, you can actually see and touch the item that’s being produced. Using a router duplicator is much like using a router table, cross cut or any other woodworking tool. A manual router duplicator (such as the Clone 3D, 4D, or Easy Carver) will dramatically speed up the carving process but it won’t spit out the finished article for you at the push of a button like a CNC router will. Reassuringly, the user’s skill will always be needed to create the finished article. A manually operated router duplicator cannot compete with the accuracy and consistency of a CNC machine but for those craftsmen who prefer a more hands-on approach to their work and want to leave a part of themselves in every finished workpiece, then a router duplicator will prove to be a valuable addition to the workshop. Who is Clone Duplicators and how did the business start? 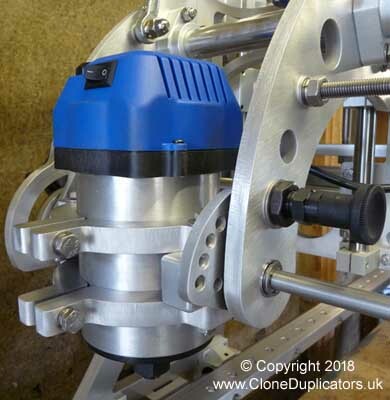 Clone duplicators came into existence back in 2007-2008, when UK based engineer, Joe Freeman, was looking for a way to copy paramotor propellers. Realising that a router duplicator could provide the answer, he set about designing and building his first propeller duplicator. The duplicator worked extremely well, so Joe decided to put the design online to see if others had a need for such a machine. Almost immediately, Joe’s propeller duplicator proved to be a success, and he soon got asked if he could build duplicator’s capable of copying everything from chairs legs to cello bodies. Since then, the Clone router duplicator business has grown steadily, with new and improved designs such as the Clone 3D and the revolutionary Clone 4D, being added. Ten years on, demand for Clone duplicator’s remains as strong as ever, and all machines are still handbuilt by Joe in his small rural workshop. The Clone customer base is worldwide, with duplicators being shipped to every corner of the globe. 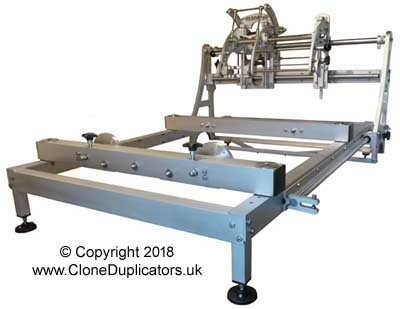 To keep up to date with the latest Clone duplicator news, including new products, check out the Clone duplicator blog or subscribe to the Clone newsletter. If you have any questions or suggestions please feel free to drop us an email.